Teen Choice Awards 2016: The Teen Choice Awards is an annual award show that airs on the Fox television network. The awards honor the year’s biggest achievements in music, movies, sports, television, fashion, comedy, and the Internet, and were voted on by viewers aged 13 through 19 through various social media sites. The 2016 Teen Choice Awards ceremony is scheduled to be on July 31, 2016. 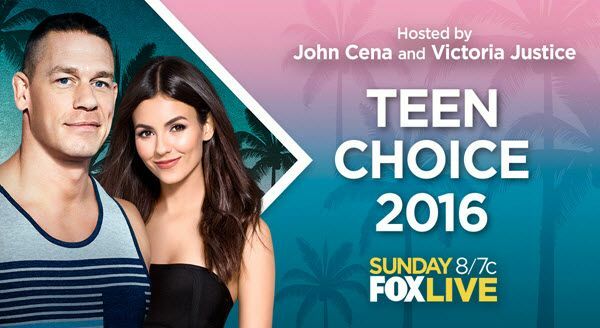 John Cena and Victoria Justice will host Sunday’s Teen Choice Awards from The Forum in Inglewood, California, airing at 8 p.m. Sunday on Fox. Jessica Alba, Jennifer Garner, Lea Michele, Sarah Hyland, Ne-Yo, Chris Evans, Daisy Ridley, Shay Mitchell and Ashley Benson are expected to attend 2016 Teen Choice Awards. Check out the complete details about Teen Choice Awards 2016 Full Show Live Streaming, Nominations & Winners List from the below article. BET Awards 2016 Nominees, Full Show Live & Winners List. Here is the full list of nominees / nominations of Teen Choice Awards 2016. 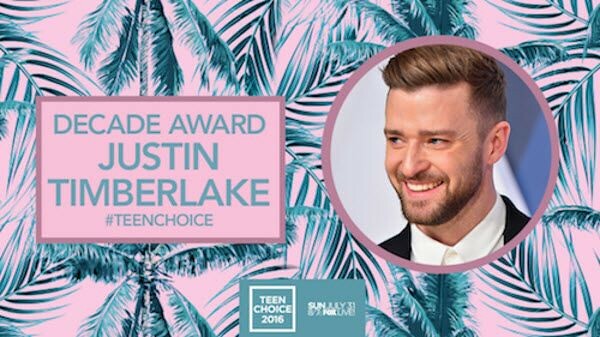 The award winners will be declared on Teen Choice Award Ceremony event held on Sunday, July 31, 2016. Dylan O’Brien – “Maze Runner: The Scorch Trials” – Winner. Shailene Woodley – “The Divergent Series: Allegiant” – Winner. “Captain America: Civil War” – Winner. Chris Evans – “Captain America: Civil War” – Winner. Jennifer Lawrence – “The Hunger Games: Mockingjay – Part 2” – Winner. “Miracles from Heaven” – Winner. Leonardo DiCaprio – “The Revenant” – Winner. Jennifer Lawrence – “Joy” – Winner. “Ride Along 2” – Winner. Zac Efron – “Neighbors 2: Sorority Rising” – Winner. Chloe Grace Moretz – “Neighbors 2: Sorority Rising” – Winner. 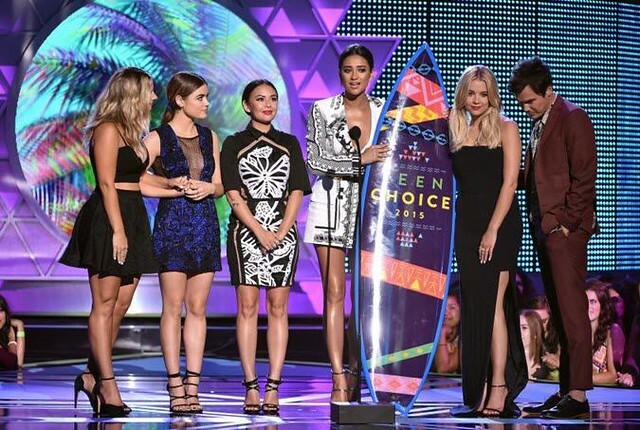 “Pretty Little Liars” – Winner. Ian Harding – “Pretty Little Liars” – Winner. Ashley Benson – “Pretty Little Liars” – Winner. “Once Upon a Time” – Winner. Grant Gustin – “The Flash” – Winner. Lana Parrilla – “Once Upon a Time” – Winner. Ross Lynch – “Austin & Ally” – Winner. Candace Cameron Bure – “Fuller House” – Winner. “Keeping Up With the Kardashians” – Winner. Ariana Grande – “Dangerous Woman” – Winner. Justin Bieber – “Sorry” – Winner. One Direction – “Home” – Winner. Adam Driver – “Star Wars: Episode VII – The Force Awakens” – Winner. Jena Malone – “The Hunger Games: Mockingjay – Part 2” – Winner. Daisy Ridley – “Star Wars: Episode VII – The Force Awakens” – Winner. Thomas Brodie-Sangster and Dylan O’Brien – “Maze Runner: The Scorch Trials” – Winner. Jennifer Lawrence and Josh Hutcherson – “The Hunger Games: Mockingjay – Part 2” – Winner. Ryan Reynolds – “Deadpool” – Winner. Janel Parrish – “Pretty Little Liars” – Winner. Sasha Pieterse – “Pretty Little Liars” – Winner. Matthew Daddario – “Shadowhunters: The Mortal Instruments” – Winner. For more Wave Two and Wave Three nominees click HERE and HERE. Teen Choice Awards 2016 kicks off at 8 p.m. EDT and will also air around the world on FOX. You can also watch a TCAs stream online for free via Fox.com or the FOX NOW app. The stream will be live in the Eastern and Central Time Zones and tape-delayed in the Mountain and Pacific Time Zones. The 2016 TCAs will also be available on demand starting Monday, August 1. Click the below link to watch the live streaming of Teen Choice Awards 2016. Hope You like this Teen Choice Awards 2016 Nominees / Nominations, Full Show Live Watch Online HD and Winners List Info. If you like this, then please share it to your friends.